Sports practices, club meetings, performance rehearsals…all on top of a full load of classes. Students nowadays book themselves from early morning to very late at night, so it’s no wonder that planners are a much sought after item come September. Jiseon Lee would like to help you plan your day by offering a schedule management app called gTimeTable. The default calendar view is weekly, and can be scrolled through by tapping the arrow buttons. You can add all your classes by tapping the + icon on the toolbar below (tap the screen to make it appear if hidden from view). All pertinent information can be entered here, such as location, time, and days held. 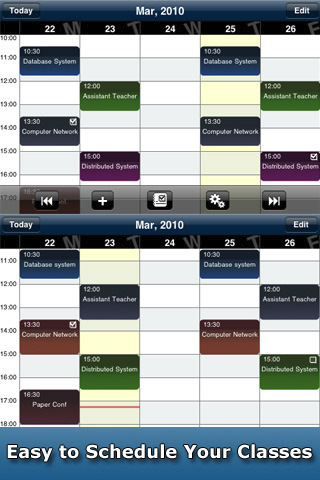 In this screen, you can also assign a color to the classes, so that classes will be easy to differentiate on the calendar. Once you’re done and back on the calendar view, you can add tasks by tapping on a class block and then Add To-Do; a reminder can be set if you’re the forgetful type. You can access all of your tasks by tapping on the third icon on the bottom toolbar, and check them off once completed. The class block the task is associated with will reflect the status of your task on its upper right corner. Tapping on the gears icon will allow you to customize your calendar further, such as whether or not to display Saturday. Also in the Settings is the option to upload your schedule to your Google Calendar, so that you don’t have to manually set up both. As purely a class organizer, gTimeTable looks pretty great. It took a couple of false starts to figure out the editing system, but after that it was fairly easy to use. I don’t know how many people use military time, but I personally don’t at all…so if we could have a 12-hour clock time option, that would be much more beneficial. Furthermore, it makes no sense that we can only have one task per class block; it doesn’t make for a very productive student. The option to integrate your gTimeTable scheduling into Google Calendar is cool, but Google does one better by allowing the addition of other things besides classes, which renders this app fairly useless. I like seeing everything I have to do all at once, so I’m rather more in favor of just using your Google Calendar than gTimeTable. So unless gTimeTable is going to start allowing us to add things besides class schedules, I would save that $0.99 and put it towards something else, like your college fund. AppSafari review of gTimeTable was written by Julie Guan on May 19th, 2010 and categorized under App Store, Calendar, Education, Events, Productivity, Utilities. Page viewed 3919 times, 3 so far today. Need help on using these apps? Please read the Help Page.